December in New Orleans is one of the most exciting times to visit the Crescent City. From Christmas traditions you’ll only find in Louisiana to the Sugar Bowl marking the new year, the jam-packed holiday season in the Big Easy is always a blast. Here’s a look at some local holiday traditions you won’t want to miss. A Jackson Square tradition since 1946, carolers gather outside the St. Louis Cathedral to sing songs by candlelight. Join in this cheerful event that brings together the community in song. Christmas song sheets and candles are provided. Jackson Square is located just blocks away from Hotel St. Pierre in the French Quarter. Dec. 18, 7 pm. This Louisiana Christmas tradition is a far cry from typical tree-lighting ceremonies found elsewhere. 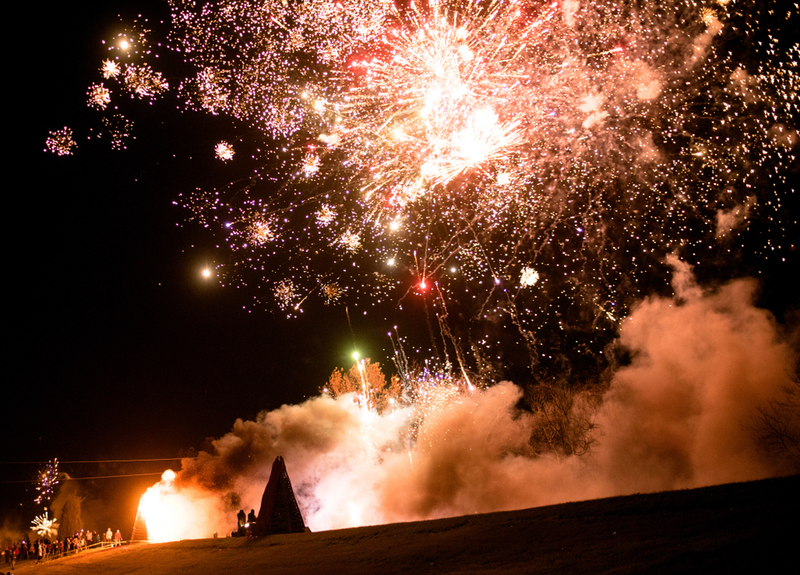 See 30-foot pyres burn along the Mississippi River on Christmas Eve for a memorable experience you surely won’t find back home. There are a few viewing options, as the Christmas Eve fires take place along the river in Gramercy, Lutcher and Paulina, about an hour outside of New Orleans. Book a tour with Gray Line New Orleans to see the huge fires from the river – it’s a sight to behold! If you’re visiting in early December, you can watch an excellent bonfire that’s lit on Algiers Point every year located just across the river from the French Quarter. Sponsored by the Algiers Economic Development Foundation, the bonfire celebration includes a free concert, food trucks and more held at the Algiers Ferry Landing. See the event date, line-up and more information at the Algiers Bonfire event website. A tradition brought over by French Catholics in the early days of settlement, a reveillon dinner – reveillon meaning “awakening” – was a large fest enjoyed after midnight mass on Christmas Eve. Technically taking place in the wee hours of Christmas morning, the feast would include breakfast foods. Later, Creole customs added wine and spirits to the mix. Today, it’s popular to enjoy this extravagant holiday meal in New Orleans at a restaurant. Popular spots in the French Quarter for reveillon dinner include the budget-friendly Kingfish on Chartres Street; Curio on Royal Street for a meal in the $60 range; or go all-out at the Commander’s Palace on Washington Avenue for a seven-course meal for roughly $100. The entire French Quarter turns into a party on New Year’s Eve. Like the ball dropping in Times Square, New Orleans has seen the gumbo pot drop, baby drop and fleur-de-lis drop from Jax Brewery – there’s no telling what this will bring. Don’t miss the big party in Jackson Square, where you’ll be right near the Mississippi River to see fireworks at midnight. The party continues on Bourbon Street until the wee hours of the morning. It’s not New Year’s day in New Orleans without the Sugar Bowl. Now in its 85th year, the fan jam begins outside the Mercedes-Benz Superdome at 3:30 pm with live music. Game kick-off is set for 5 pm. See additional ticketing and event info. What are you waiting for? Visit the most haunted city in the country this season. Check out rates at Hotel St. Pierre, located in the heart of the French Quarter.